Melting Heart Chocolate Fondant – Life! The idea of baking a normal size birthday cake for myself was not appealing. It’s not that I don’t like baking or that I don’t love cake. I just don’t need a whole cake sitting around here for Rick and I to eat. 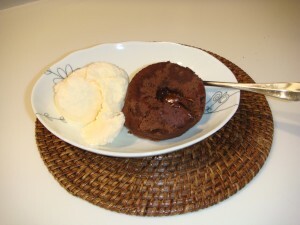 Awhile back I found a recipe for Gordon Ramsey’s Melting Heart Chocolate Fondant on my friend’s Urban Mums blog. I decided that I would make two of these instead of a cake and serve them with a little Haagen Daz. So now you may be wondering why the baking on my birthday. Rick offered to take me out, but I chose to go tomorrow instead because it is a Japanese holiday and he will be home all day. Hooray! Now the trick is deciding what kind of yummy Japanese food I want to eat then. P.S. The recipe is also on my food blog YUM!